I was looking for a good restaurant that was walking distance to the Centre for Performing Arts to listen to Maya Angelou last month and upon Ning’s recommended made reservations at Q4 al Centro for our group. Don’t let the fact that I waited a month to blog about this place take away from what I’m about to tell you about it – read on, it’s worth it. First off, the restaurant was smaller than expected but no less busy in the early evening. We were a party of five eating before six p.m. so we wouldn’t miss a minute with Ms. Angelou. I shared the Q4 Meatballs appetizer three ways, another great recommendation by N! It provided three generous meatballs with wonderful Fontina grated to melt on top surrounded by a very delectable pomodoro sauce. Many of us sopped up the remaining sauce with bread so not a drop would go to waste. While I can guess that this restaurant changes their menu often (as what I had is no longer on their current menu), I still want to tell you about my veal chop. 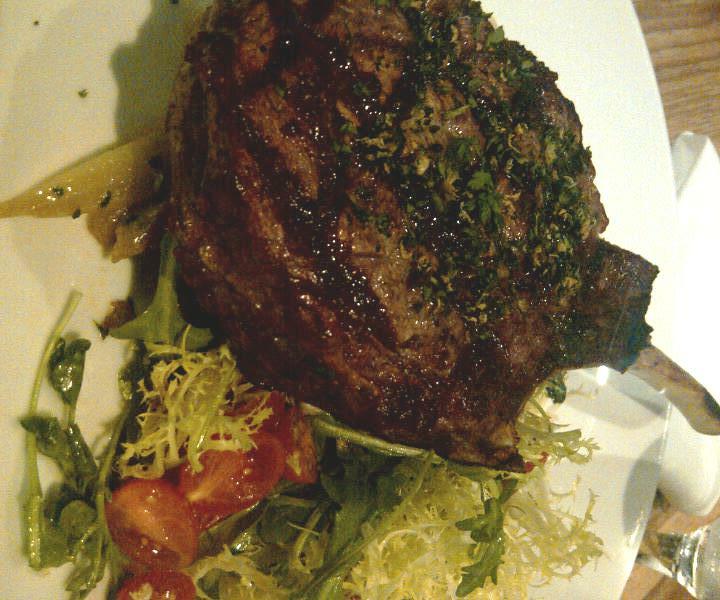 It should have been described as a double-cut veal chop – it was so large. The portions weren’t generous just for the food I ate. I know that others had pasta, salad, and seafood as their entrees and all were quite filling. Not one to resist a carnivorous challenge, I was up to the task. I enjoyed the tender asparagus spears (hidden behind the chop in this shot) and the lightly dressed salad, but all of these vegetables were mere bits of distraction compared to the tasty veal chop. I don’t think there was any doubt from the broad grin on my face that I finished that chop with immense satisfaction! Descriptions of what's in my mouth and if I think it's Mmm...Sarap!